Did you know that over 27% of Valentine’s Day flower orders are placed by women? And that 10% of all Valentine’s flowers are delivered to men? Direct2florist is seeing an increasing volume of Valentine’s Day flowers being delivered to special fellas across the globe. 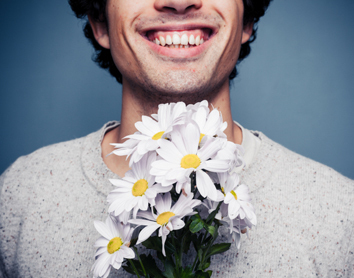 The modern man clearly loves a gift of flowers! At Direct2florist we’ve got lots of gift ideas for the special man in your life. If he’s a traditionalist then perhaps the ideal way to send your love is with a single, classic red rose. Lovers have exchanged red roses for centuries so why not follow in their footsteps? Or, how about a plant that is a welcome antidote to his hectic day? Or more structural masculine flowers such as anthuriums, exotic tropical flowers such as heliconia, or chrysanthemums which signify friendship. If your special man has a sweet tooth why not add some chocolates to the order too? Of course flowers can be sent given on any occasion and men love to get flowers for the same reasons they send them – so think birthdays, anniversaries etc. Alternatively, you could send them to celebrate a success at work – this is where something for his desk such as a plant could work well. Men love their homes and interior decoration as much as women do, so flowers for the home will always go down well – take your time to consider what his place looks like and send flowers to match the interior accordingly.